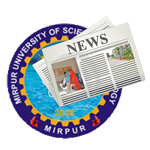 Mirpur University of Science and Technology (MUST), Mirpur retains W-Category (85-100%) by securing 88.40% in the Pakistan’s most widely read university ranking. This league table is made up of seven indicators including Quality Assurance, Institutional Performance Evaluation (IPE), MS/MPhil & PhD Review, Student-staff ratios, and SAR report completion, Civic Engagements, Awareness Seminars/Workshops and Membership of International Bodies around the globe. The result is the latest HEC-QAA league table success for MUST. For the year 2017-18, QAA of HEC made certain changes in its ranking criteria by adding both external and internal Institutional Performance Evaluation (IPE) and MS/MPhil & PhD Review completion as a major component. It is worthwhile to mention here that this is the fourth consecutive year, MUST has featured in the W-Category in this guide, which ranks Universities across Pakistan.